<Parmigiano Reggiano: from field to our tables! The Venetian plain which lies between the Berican and Euganean hills provides a stable and characteristic natural environment. The protection of the two groups of hills greatly influences the prevailing winds, the rainfall and the ambient temperature. The climatic stability therefore particularly lends itself to the maturing process of the hams. For the Venetian farmers, once the harvesting season was over, there came the right moment for slaughtering the pig, marking the beginning of a period which lasted until the end of January. In those days each peasant family owned one animal, and for many of them this was their only source of wealth. On the appointed day, men, women and children alike would help the butcher known as the “mazzin” in the preparation of the various parts of the pig. At that time the peasant’s world was a poor one, a time when best cuts were offered for sale at the market in order to earn that sum which could in some way improve their miserable conditions. On the 25th of november, St. Catherine’s Day, the agricultural shows in Montagnana and the other villages along the Berican-Euganean hilltops, marked the beginning of the bargaining for the best fresh hams. These were to become hams in the hands of the specialist pork-butchers, the ancestors of today’s producers of hams. Expert hands would then kneed and sprinkle them with salt, carefully following the rules laid down by the Veneto school, rules which are even today strictly applied. Moreover the work of the master-pork butchers was aided and enhanced by the natural cycle of the seasons which added the necessary climatic changes. Therefore salting, drying and maturing processes came about in a natural atmospheric environment, taking the greatest advantage of first the dry and cold conditions and then little by little the increasing midness of the climate. Finally, when the season was right, hams were washed down in the open air and then hung out to dry. They were then distributed amongst the best pork-butchers in the city. The Consortium of Veneto ham was born in the early Seventies on the initiative of some local producers and has the task of protecting and promoting the ham in this area is processed and cured according to ancient customs and traditions. The international recognition came in 1996: the European Union gives to the Veneto ham the Protected Designation of Origin (DOP) brand, which guarantees the very close link between production and land. The production area covers 16 municipalities situated between the Berican and Euganean hills with Montagnana, headquarter of the Consortium. An independent Institute for Certification controls every step of the whole chain: only after rigorous controls, Veneto ham can be branded with the Lion of San Marco and the word "Veneto", which happens not before reaching 12 months of seasoning that can be brought up to 14-15 months in order to optimally capture all its fragrance, its pink color and its extraordinary sweetness. 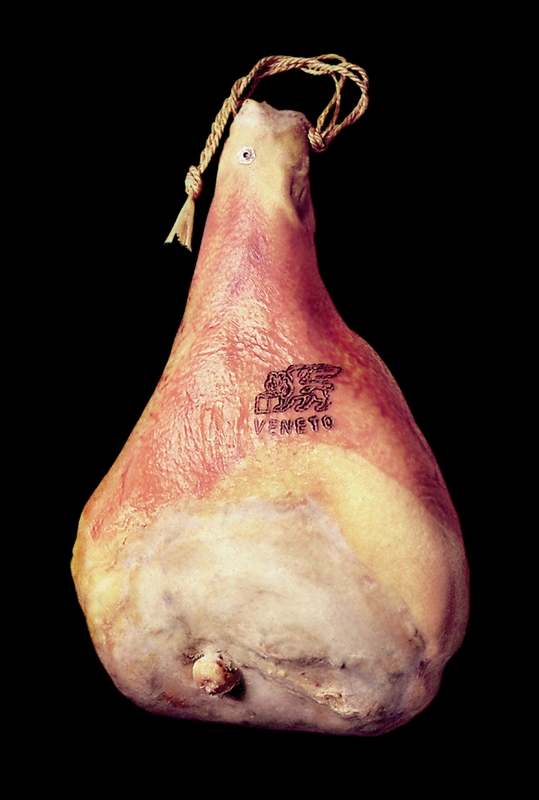 Veneto Ham must be sold with: marking indicating origin and suitability of the legs; marking indicating authorised abattoir; metal seal indicating month and year of salting; branded Consortium mark indicating place of production; producer’s trademark. Veneto ham has a rosy colour when cut. The elegant, lively and full flavour of Veneto ham is the result of a perfect balance between salting times, weight of the ham, curing time and conditions: a perfect blend of sweetness and fragrance. Its organoleptic characteristics and its salt, fat and protein content make it suitable for any type of diet. 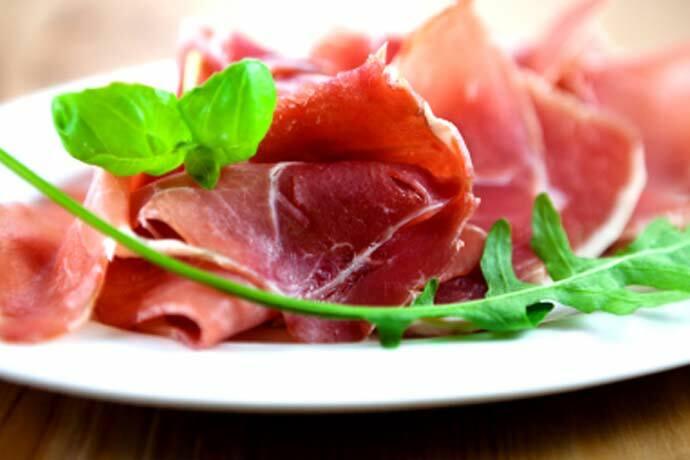 Due to its delicate aroma and tenderness, Prosciutto Veneto is an ideal base for prestige appetisers, starters, main courses and accompaniments.